When you open the Windows Component Services Configuration Console (dcomcnfg), you see a red, downward-pointing arrow on the My Computer icon under Component Services as shown below. This error is commonly caused by the MSDTC service being set to run under the local system account instead of NT Authority\NetworkService. Right-click TurnOffRpcSecurity, then select Modify. Add a value of 1. Open the Services Console and stop the MSDTC service. Right-click the service and select Properties on the popup menu. When the Properties dialog opens, click the Log On tab and change the identity to NT Authority\NetworkService (the password is blank). Click Apply then click OK.
Return to the Services management console and restart the MSDTC service. 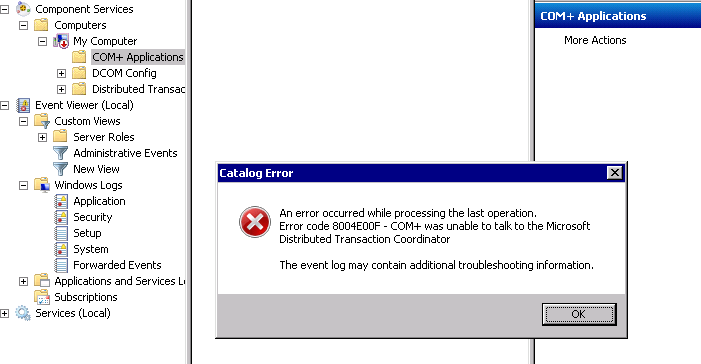 If the problem persists, check the Application Log within the Event Viewer and look for errors (red icons). The Event Viewer is a great resource for finding out what is really going on. Open a command prompt (cmd). This entry was posted in COM+, Exceptions, Uncategorized and tagged 8004E00F, COM+, dcomcnfg, DTC, MSDTC, Windows Server 2008.